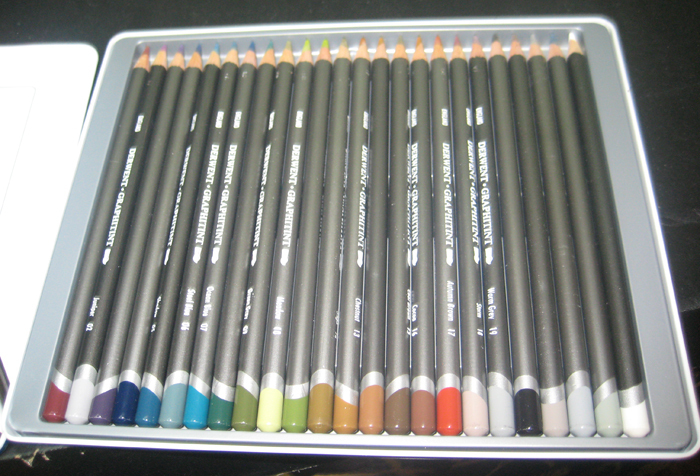 These are the supplies that I have acquired since my first post. Yes I'm such a hoarder, or rather more euphemistically, a 'collector' XD. 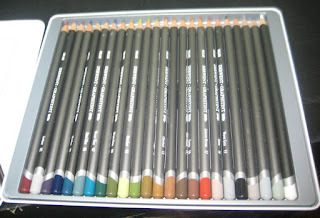 I just love having all these different colours and stuff to play with! 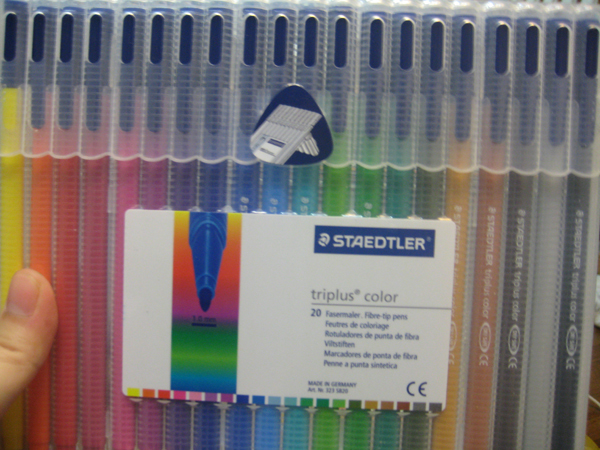 I guess I've reached a saturation point right now, because before I would just keep on buying and buying. 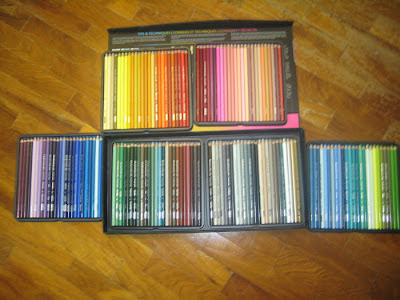 Now I've got so much yet I've had to use a lot of them. 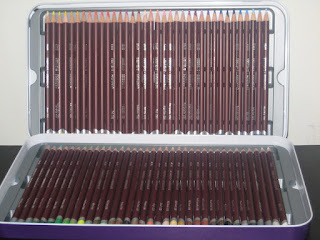 my proudest addition to date: the most extensive, complete and EPIC set of Prismacolors! Totes worth it. They're arranged in three layers of two 'trays', The bottom trays is in the box, the middle trays are on the side and the top trays are resting on the flaps. Stephen bought from Ebay and sent it to me, it just arrived today (thanks honey!). Now if you wonder why I would buy a second hand set of Prismacolor when I already have a big one, it's because these pencils are manufactured by Berol before being handed over to the current Prismacolor manufacturer, which is Sanford. 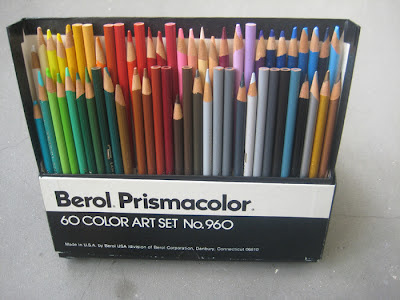 I heard that the Berol pencils are more 'buttery'. I haven't tested it yet though so I can't tell you for sure. 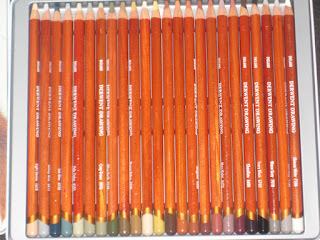 very very creamy pencils! It's so fun and is such a pleasure to draw with. 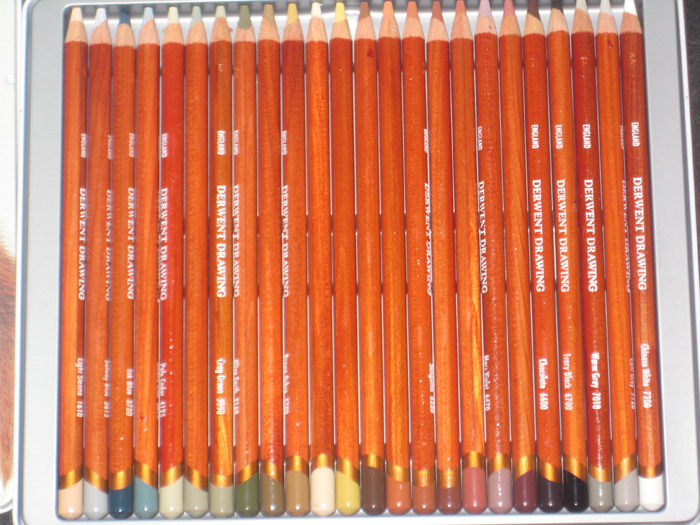 The texture of the pencils is like a cross between coloured pencils and oil pastels. 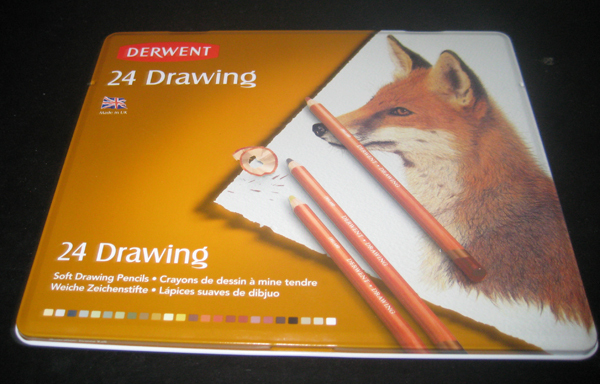 Funnily enough, I didn't like Coloursoft at first when I first bought one pencil from open stock to try. I'm glad I continued to give this a chance and now I'm really starting to like them. They're as soft as they say, yes, but I think the problem is that when I see 'soft' in coloured pencils, I automatically think of Prismacolor Premier, which is very waxy and crayon-like in consistency. 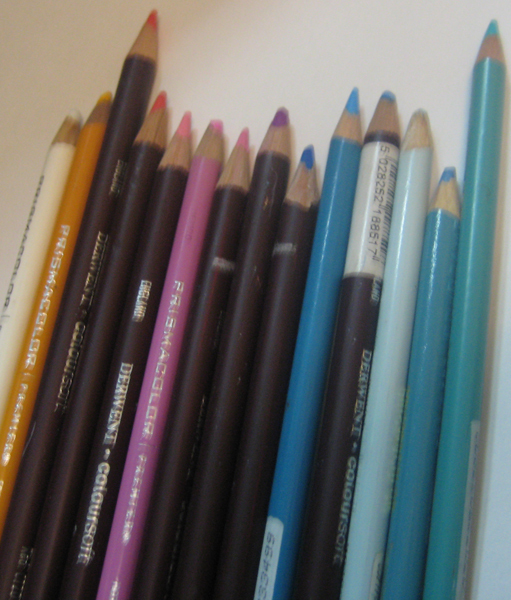 These pencils are kind of a clay-like, dry kind of soft, so it's good but in its own way and really shouldn't be compared with Prismas. Haven't tried these yet, but I can't resist. 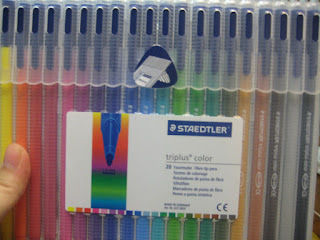 I bought these on open stock.White and Turquoise Blue. You know, I thought that the cheapie sets of Pentels I have were pretty decent, but oh boy was I wrong! 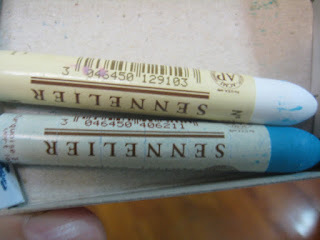 When I tested the Senneliers at the store - it feels like soft, melting butter! What a world of difference it is! In fact, for the price of these two oil pastels I could buy a set of 48 Pentels. Prismacolor pencils and Derwent Coloursofts. Good thing I've catalogued and taken photographs of all these. Would be good for insurance one day. 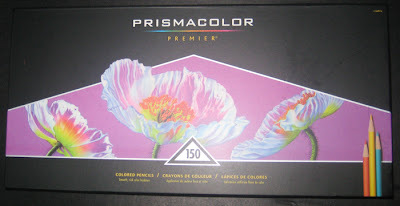 This post could have been written by me :D And the 150 set of Prismacolor Premieres is mine too! I boght the Graphitint and the Verithins and have others as well. More collected than ever painted and drawn. I am right at using them all finally. I really love this blog entry. How are the Verithins? I never thought about buying one because over here, Derwent Studio would be easier to obtain, and plus I don't really think I'd have a use for it. 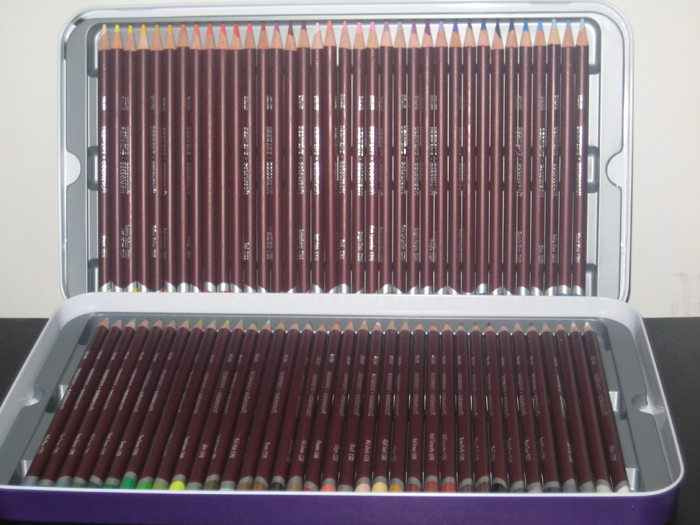 Should World War 3 break out, I think Ill have enough art supplies to last me an entire war. I meant "fabricated by Berol"